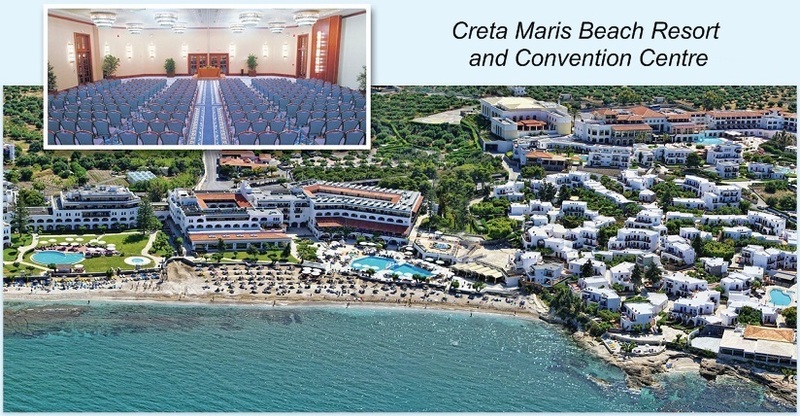 Creta Maris Beach Resort, located on a long sweeping bay of sandy beach and crystal clear water, is recommended as the main hotel of the Conference. Creta Maris, a small village with quaint twisting paths, small piazzas filled with the scents and colors of a wide variety of trees and flowers, is a unique combination of Aegean Architecture, Cretan hospitality, green oriented environment, and high quality services. Many of the guest rooms offered are available with relaxing views of the Mediterranean Sea, the sandy beaches, or the hotel gardens. Creta Maris, is 26 km (16 miles) east of Heraklion International Airport, next to Hersonissos village. A number of rooms have been reserved to be allocated on a first-come-first-served basis, and reduced rates have been agreed with the Resort. These rates are valid for all Conference participants for the duration of the Conference, as well as for 2 additional days, before and / or after the Conference, based on availability. Please also note that, there is a cut off for reservations thirty days before the Conference. Any requests after that time will be placed on a space available basis. Creta Maris Beach Resort is currently sold out for the nights of 24, 25 and 26 of June 2014, but continues to accept reservations for all other nights. The above rates INCLUDE breakfast and taxes. Free Wi-Fi network connection is available to all hotel guests. Check-in time is 3:00 PM and check-out time is 11:59 AM. The above rates are valid for 2 additional days, before and/or after the Conference, based on availability. The first child under the age of 14 shares the parents’ rooms without any charge. The second child under the age of 14 shares the parents’ rooms with a 50% discount on the per person price per double room. Additional guest room options (suites, bungalows etc.) are available through the Resort’s reservations web site, using the link Book Now above. A valid credit card is required to place each reservation and a non-refundable one night’s room deposit will be charged. Reservations may be cancelled without additional penalty 30 days prior to the arrival date. Full charge of the reservation will be made on your credit card one month before the start of the conference. For more information about the Resort please check the hotel's Frequently Asked Questions web page.